A brilliantly structured thriller, an original concept and an actor, Ernst Umhauer, that has already received the prize for Best Newcomer at the Lumières of French Cinema: In The House keeps you on the edge of your seat from begining to end. But when Ozon’s camera sneaks into the house of a middle class family, spies on them and begins to interferes in their daily life, the lines between observation and voyeurism get thinner and thinner. At Gustave Flaubert High School, pupils in uniform trudge back to their French literature class. Their teacher, Mr Germain (Fabrice Lucchini), exasperated by their appalling standard, gives them an easy assignment: to write an essay about their last weekend. Going through their dissertations lacking both creativity and style, Mr Germain starts to lose faith in education, until he reads Claude Garcia’s (Ernst Umhauer) piece of work. This young 16-year-old boy went to one of his classmate’s house to teach him math's, observed his middle-class family and cynically commented on their way of life. Mr Germain, impressed by Claude’s talent for writing, starts teaching him how to better tell a story. He encourages him to return to their house and write about them. But their lives are too conventional and insipid to make for good fiction, so Claude begins to manipulate them to add more excitement to his characters lives. He pretends to be “Rapha”’s friend, seduces his mother, Esther (Emmanuelle Seigner) and acts like a second son with the father. Nevertheless, blurring the lines between fiction and reality will lead to a serie of incontrollable events. In The House guides us through the fascinating process of storytelling. Before sneaking into the house, Claude Garcia used to sit on the bench in front of their house and imagined stories. Once in the house, however, and Claude's concept of where fiction ends and reality increasingly blurs as he begins to play with each family member’s feelings as if they were mere fictional characters. Manipulating each one of them is part of a strategy to make his protagonists more exiting, to build a better plot and to find an end to his story. But his game soon spirals out of control and has a dangerous impact on the family, his teacher and himself. This whole process of story telling is explicitly showed in the movie thanks to the relationship between Claude and Mr Germain. The teacher reads Claude's texts aloud and comments on what does or doesn't work, what should be changed and so on. This process allows the audience to see how a plot builds itself up, how characters are created and how fiction blends with reality. Moreover, this storytelling process refers directly to what a film director does. Using reality to nourish fiction and fiction to transform reality is a direct reflection of the film-making process. This whole tension between fiction and reality makes the audience think about how both interact not only in the story but also, more broadly, in cinema or literature. François Ozon has signed a disturbing but brilliantly structured thriller. The audience is kept on the edge of their seats from begining to end thanks to a brillanty structured script. In The House is divided in episodes that correspond to Claude's visits to the house. At the end of each narrated intrusion, he concludes with a note "to be followed", permanently increasing the suspense. But not only is this movie breath-taking, it is also disturbing. The first disturbing element of In The House is Claude Garcia’s nightmarish blue eyes, which unveil his manipulative, perverse, voyeuristic and narcissist personality. Brilliant and repulsive in equal measure, Claude Garcia forces the audience to participate in his edgy and limitless game. He uses his charms to create unrest in this calm and peacefull family, hoping to build a stronger plot. Another very disturbing element of the film is the relationship between Mr Germain and his pupil. Is Claude the son Mr Germain has always dreamed of? Or, is it secret love and stifled homosexual attraction? once added to Claude’s permanent seduction, this tension between the student and the teacher builds up to a highly tense atmosphere. A despising caricature of popular culture. First and foremost, the “Rapha” family appears in the movie, as the pure incarnation of middle class France. The mother does not work and spends her entire day thinking about how to decorate her house, hence Claude's description: “she is the most bored women ever”. The son, “Rapha”, is like his father: stupid, purely business-orientated and obsessed with basket-ball. 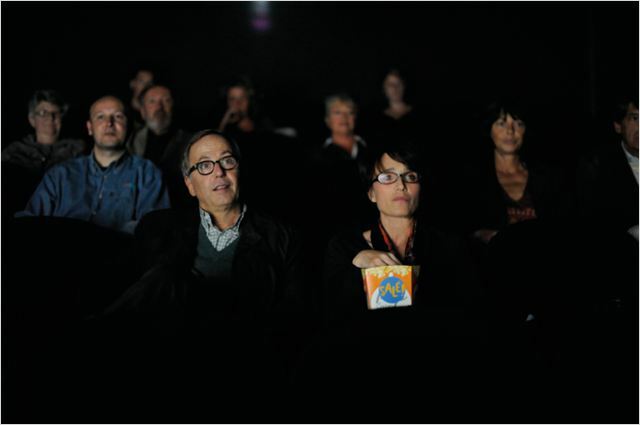 In this movie, François Ozon, sets this popular culture shown as inferior in opposition to the "higher" culture of Claude and Mr Germain. Both of them share a love for literature, painting, foreign languages and art. This opposition between popular and "high" culture is far too stereotyped and manichean. However, Ozon’s main goal was not to depict modern French society, but to play with these stereotypes to blur the line between fiction and reality in his plot. His irony allows him to play with social caricature without becoming too irritating and ridiculous. Verdict: A fascinating film, punctuated by Claude Garcia’s intriguing writing, a great cast, a thought-provoking movie. A must see. As I've yet to see this film anything other than the most general comment would be inappropriate. I've seen seven of 34 films directed by Ozon, albeit some of his output consists of shorts and I fail to share the widespread acclaim of his work finding him both precious and pretentious compared to other directors working in France today. If, hypothetically, several French directors were releasing new films the same day I would go first to those signed by Tonie Marshall, Ann Fontaine, Danielle Thompson, Marion Vernoux, Richard Berry, Denis Dernicourt. Perhaps significantly the Ozon films I found most palatable to date were 5 Women and 5 x 2. This does not mean I am ready and/or prepared to write him off and this new film does seem of interest.